SCOTTSDALE – For 796 days, Daniel Hudson didn’t feel part of the Arizona Diamondbacks. Two consecutive Tommy John surgeries left him on the outside looking in. That finally changed Sept. 3 when he returned to the big league mound in relief against the San Diego Padres. “It honestly felt like I was making my Major League debut all over again,” Hudson said. It was a quality outing and so much more. After a clean 1-2-3 inning, players throughout the D-Backs organization became emotional watching him walk off the field. Relief pitcher David Hernandez, whose 2014 campaign was derailed after he underwent season-ending reconstructive elbow surgery, watched from home. Veteran pitcher Bronson Arroyo, a journeyman entering his 16th season, was injured at the time. Instead of watching from the dugout, he was in an Arizona restaurant when he started to feel the room’s atmosphere change as Hudson began to warm up. The appearance was one of three Hudson made last season. Although the next two resulted in four earned runs in 1 2/3 innings, it was the first time out that made its mark. Hudson did not shy away from thanking the organization that has stuck by his side through his lengthy rehab stint. While rehabbing his own season-ending elbow injury, Hernandez looked to Hudson as a role model for perseverance. Now that Spring Training has arrived, all eyes will be on the final steps of his recovery process. It will be Hudson’s first full Spring Training since the 2012 season. Catcher Tuffy Gosewisch has been getting to know Hudson. He likes what he sees of the right-hander who won 16 games in 2011 before he was sidetracked. According to Arroyo, the biggest hurdle pitchers face on the comeback from long-time injuries is their mindset. Hudson’s personal objective this spring is much simpler than that. 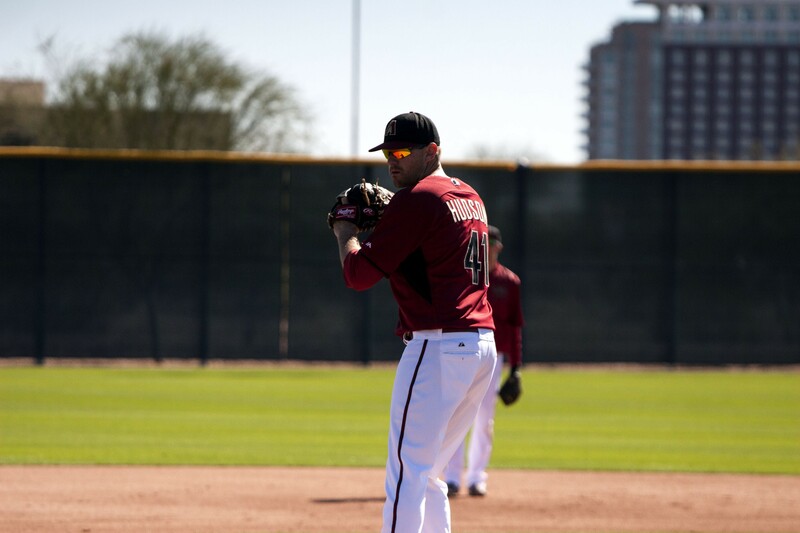 D-Backs starting pitcher Daniel Hudson fully participates in Spring Training drills for the first time in three years. D-Backs pitchers Josh Collmenter and Daniel Hudson warm up for Spring Training practice.